Up until now we’ve only encountered very simplistic HTML tags, and we have ignored the fact that many HTML tags can specify attributes. In this instalment we’ll look at two tags that require attributes – those for inserting images into pages, and those for inserting links into pages. Before we can look at the two tags in question, we need to lay two pieces of ground-work – we need to discuss attributes in HTML tags, and we need to discuss URLs, and particularly the difference between relative and absolute URLs. HTML is the HyperText Markup Language, so what makes text hyper? The answer is links. A text document has a beginning middle, and end, while a collection of hypertext does not. Hyper text contains jumping off points where you can leap from one piece of text to another, in other words, hypertext is linked. There is no beginning middle or end of the world wide web – it’s just a collection of web pages that link to each other. Reading a news article that contains a link to a wikipedia article that contains links to related terms is what hypertext is all about. The thing is – in order to link someone to something, you have to have a way of addressing it. Within our computer we use our local file system to address files, if you say that your essay is in C:\My Files\My Important Essay.txt, or /Users/bart/Documents/My Important Essay.txt, there can be no doubt where that is on your computer. The world wide web does not exist within a single computer though, so a different addressing scheme had to be devised, one that extends beyond any single computer, and allows data to be addressed anywhere on the world wide web. The solution was the Uniform Resource Locator, or URL. The protocol that should be used to access the data, also known as the URL Scheme – on the world wide web that’s usually http or https. The server hosting the data, either as an IP address or a DNS name – often referred to as the host. Optionally, a port number can be specified. This is only needed if the host is serving the content on a non-standard port, that is to say, if the host is using HTTP on a port other than 80, or HTTPS on a port other than 443. The path to the desired data on the host. The path is a series of zero or more names separated by / characters. This looks like a Unix/Linux file path, but shouldn’t be confused with one. Every web server gets to interpret these paths any way it wishes. The path can be empty. An optional query string – this is a mechanism for passing information between browsers and servers, and something we’ll ignore for now. It will become important later in the series though, so we’ll learn about it then. Finally, a URL can optionally contain a fragment name – a way of specifying a specific section within a page. The data within URLs can only contain a small set of very basic characters, digits, un-accented characters, dashes, dots, and underscores. Other characters can be specified, but they have to be URL encoded – that is to say, replaced with a percentage sign followed by a two-digit hexadecimal code. When using the UTF-8 character encoding (the default in HTML 5, and the encoding used in this series) some single special characters are replaced with multiple hex groupings. You’ll find a good list of the encodings here. URL encoding is required in the path, query string, and fragment components of a URL. Every web server is free to interpret the path part of a URL in any way it wishes. In this series, the recommended server software suite is MAMP, and the A in MAMP is for Apache. In other words, if you are following along using the suggested setup, you are using an Apache web server, so paths will be interpreted in the default Apache way. Apache interprets the path part of URLs as a file path relative to its configured document root folder. If the path part of a URL maps to a folder rather than a file within the document root, Apache looks for a so-called index file within that folder, and uses that to represent the folder. Apache will search through an ordered list of special file names to find an index file, and use the first one it finds. If none of the special files exist within the folder, Apache will return some simple HTML representing a listing of the files in the folder. The default Apache config included in MAMP specifies just two special filenames to try – index.html first, then index.php. This is why we have been calling our sample files index.html in all our instalments. Most web servers behave in a similar way by default, though the exact list of default index file names varies. Many servers will also include index.htm for example. If all URL specifications were absolute, they would need to be changed each time a HTML file moved from one web server to another, or even from one folder to another. This would make things very difficult for web programmers, and make portable HTML code impossible. URLs relative to the path – URLs that do not start with a URL scheme, a /, a ?, or a # are interpreted as being relative to the current URL path. I.e. the URL scheme, host, and port are assumed to remain the same, and the remainder of the URL is re-calculated based on the relative URL. URLs relative to the host – URLs that are relative to the host start with a /. The URL scheme, host, and port are assumed to be the same as the current URL, the path, query string, and fragment are taken from the relative URL. A relative URL of /My+Other+Folder/ on a page with the URL http://localhost/My+Folder/ is interpreted as http://localhost/My+Other+Folder/. Local Fragments – URLs that start with a # are interpreted as being references to fragments within the current page. That means the URL scheme, host, port, path, and query string are preserved. The relative URL #section1 on a page with the URL http://localhost/My+File.html is interpreted as http://localhost/My+File.html#section1. Note that the same relative URL on a page with the URL http://localhost/My+File.html#section2 will also be interpreted as http://localhost/My+File.html#section1. A HTML tag attribute has a name and a value. Only officially defined attribute names should be used, and the values should meet the requirements defined in the specification. Some attributes can have any arbitrary value, including no value at all, while others must contain a URL, or a number, or some other specific type of information. Attributres are specified within opening and void tags only. They go after the name of the tag, and the name and value are separated by an = character. The value must be contained within a pair of " characters. Tags can specify multiple attributes. The tag for inserting an image into a HTML page is <img />. This is a void tag, and requires a number of attributes. So far we have encountered block-level tags like paragraphs and headers, and inline tags like emphasis and code. Most tags fall neatly into one of these two categories, but there are a few odd-ball tags that don’t – the <img /> tag is one of these odd-balls. It’s a so-called inline-block tag. Images are effectively treated like giant characters, and inserted into the document accordingly. Using CSS it is possible to make images behave in different ways, so we’ll re-visit the positioning of images in a future instalment. Alternative text describing this image. This is the text that will replace the image in text-only browsers and screen readers for the visually impaired. The attribute is not technically required, but leaving it out is exceptionally bad form, so consider it required. Also, be sure to always use useful alt text – ‘logo’ is useless alt text ‘Podfeet Logo’ is useful alt text. This optional attribute can be used to specify text that should be displayed as a tooltip when the user hovers their mouse over the image. This is not the same thing as alt text. It exists to allow extra info for users be specified, not to tell screen readers what the image is. All images should have alt text, but only images need titles. A web browser cannot know how big an image will be until it has been downloaded. This means that when it’s rendering the page it doesn’t know how big or small a gap to allow for it. That means the browser has to guess, and the re-flow all the content on the page when it knows how big the image really is. This is inefficient. You can help the browser by telling it what size the image will be within the <img /> tag. This is done using the width and height attributes, the value of which must be positive integers representing the appropriate dimension in pixels. In the past, when our bandwidth and CPU power were much much lower, the use of width and height attributes was very important. Users would notice really speed improvements on websites that used them compared to websites that didn’t. Now that most of us have really fast internet access, and now that our CPUs are so much more powerful, the use of these attributes no longer has a noticeable effect on page load times in most real-world scenarios. The width and height attributes can also be used to scale an image. If an image is actually 300 pixels across, you can render it half-size by specifying a width of 150. If you only specify one dimension, images are scaled proportionally, but if you specify both, they are stretched to fit into the defined rectangle. Be very careful about scaling images in this way – it’s very bandwidth inefficient. If you have a massive 5MB image, and you show it as a small thumbnail by specifying a small width and/or height you are wasting a lot of bandwidth. In general it’s better to create small versions of images using an image editing app rather than scaling images with the width and height attributes. 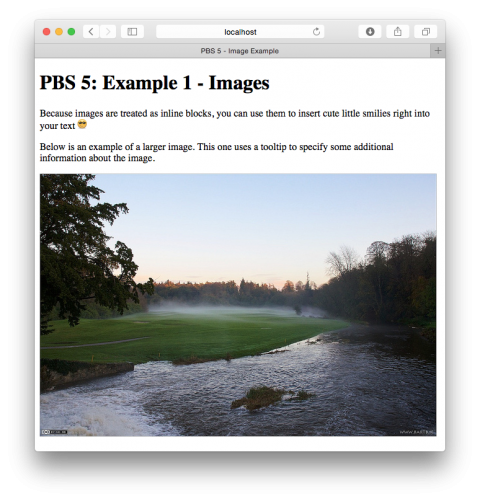 Because image files are required to make this example work, I’ve created a zip file containing both the HTML file and the referenced images. You can download it here, and then place the three files contained in the zip file into a folder called pbs5a in your web server’s document root folder. Rather confusingly, the same tag is used to define named fragments within a page, and to create links to other URLs. Even more confusingly, the tag is the <a> tag. In this case a stands for anchor, but that’s not actually much help! The attributes specified determine whether a specific instance of the <a> tag is defining a named fragment or a link. To add a link to a page, use the <a> tag with the href attribute. The content of the <a> tag will become the linked text, and the href attribute should specify the URL to link to. The URL can be absolute or relative. It’s possible to add tool-tip text using the title attribute. It’s also possible to request that the browser open the link in a new window using the attribute and value target="_blank". Exactly what will happen when this kind of link is clicked is determined by the browser. Modern browsers tend to open such links in new tabs. URLs can optionally specify a named location within a page to jump to, this is known as a URL fragment, and specified at the end of the URL with the # character. This is useful in very large documents with many sections. These fragments are also known as anchors, hence the name of the <a> tag. Anchors are created using the <a> tag with the name attribute. When creating anchors, the <a> tag usually has no content, but because it is not a void tag, it must still be written with a closing tag. Again, because the example involves multiple documents, I have zipped the files up and you can download them from here. Extract the zip and copy the two files it contains to a folder called pbs5b in your web server’s document root. We have now covered the basics of HTML. We can create documents with properly marked up content, correctly marking sections of text as headings, paragraphs, lists, etc.. We are now ready learn about using CSS to style our documents. Once we’ve learned the basics of CSS, we’ll be re-visiting HTML to learn about some more tags we’ve ignored for now. The reason we’ve ignored these tags on our first pass through HTML is that their usefulness is not obvious until you know about CSS. I would contend that it IS still good practice to specify image dimensions in the img tag. Why? Because even today I see web sites bounce around as they build the page. It may often not be images sucking the bandwidth – more likely scripts – and sometimes it’s not image blocks that resize, but every little bit helps. This happens on a Core i7 Mac with Ethernet connection to a 100Mb/s fibre service. It’s worse on mobile, of course. I am finally getting around to actually working the examples in this series. As a screen reader user, I appreciate you discussing screen reader users. I think you could have introduced one more attribute in this section to assist people with screen readers, the lang attribute. It should be applied to the html tag and to any tags where the language changes from that specified in the html tag. “…first installment – PBS1 Exmaple. attribute is no longer used in HTML 5. If we are true to HTML 5, shouldn’t we be using an ‘id’ attribute rather then ‘name’ to mark an anchor? I know you will be covering the ‘id’ attribute when we get to CSS, so maybe this gets discussed then. Thanks for the wonderful series. I’m learning a lot.